March is officially here! March’s birthstone is aquamarine, which is a watery, green-blue gemstone. Aquamarine is a variety of beryl and scores between 7.5 and 8 on Mohs scale of mineral hardness. The calming blue color of the stone is reminiscent of seawater, which is directly how the gemstone received its namesake. deBebians carries a wide variety of gemstone jewelry, including March birthstone jewelry. These gifts are ideal for someone that was born in March or has a child that was born in March. 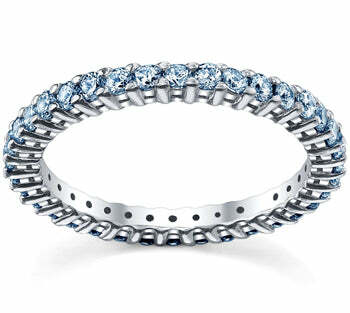 An aquamarine eternity ring can be worn next to an engagement ring, on its own, or stacked with additional eternity band designs. This ring has a shared prong setting and is set with AAA quality aquamarine gemstones. This ring has a versatile 2mm width can be set with approximately 0.70 cttw gemstones. 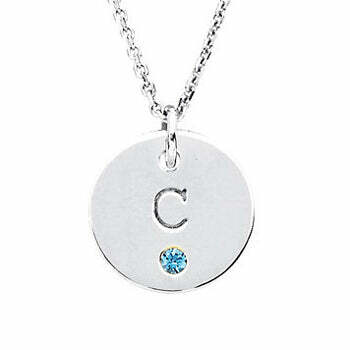 If you are looking for a simple, timeless piece of jewelry this initial pendant is a lovely option. This gold disk features your birthstone of choice and one initial of choice. The diameter of the pendant is 12.7mm and the gemstone has a 2mm width. 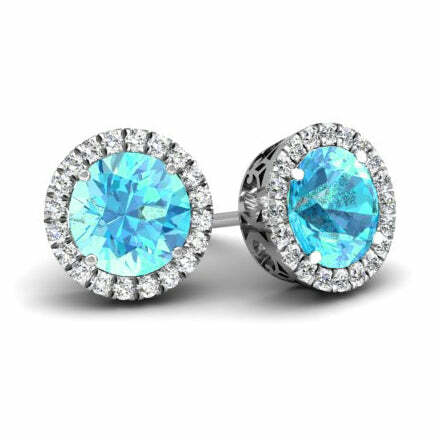 Our aquamarine halo earrings are exquisite. The halos are set with G-H color SI clarity diamonds that weigh approximately 0.50 cttw. The center stones are available in your choice of 1.00 cttw, 2.00 cttw, and 3.00 cttw. These earrings are made in 14 karat gold. Browse our entire Gemstone Jewelry Guide to see more jewelry that features aquamarine gemstones. We have a piece of jewelry that will work with any budget and suit and taste.